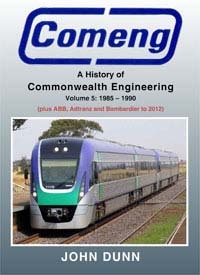 This volume takes up the account of Comeng's history from 1985 (where the previous volume left oft) and carries the story through to 1990-and then on into the post-Comeng era at Dandenong of ASEA Brown Boveri (ABB), Adtranz and Bombardier. In 1985, and under the most difficult of circumstances, the Dandenong plant in Victoria won a contract for new light rail vehicles for Hong Kong-their first export order. Though this potentially opened the door for further export work for Comeng in South-East Asia, the ANI directors were unprepared to follow up such opportunities. By 1986 railway rolling stock contracts were drying up in Australia, and the Comeng management was looking for other opportunities overseas. Bids were made on a score of fronts, though without any success. This was largely because the Australian Government was unwilling to financially support Comeng in the same way that foreign governments backed their own manufactures. Comeng just could not compete under those circumstances. There was a ray of hope in 1986 when an inquiry came from North America for Comeng to tender on new commuter trains for the Long Island Rail Road in New York. The project was pursued with vigor, and Comeng became the preferred bidder against worldwide competition. The contract was virtually 'in the bag' when, at the eleventh hour, ANI pulled the plug and so the project collapsed. When ANI pulled out, this symbolically signally the end of Comeng. Behind the scenes ANI was in trouble financially and Comeng became one of the causalities. All the plants (except that in Dandenong) were progressively wound down and closed. By this time the highly successful and profitable South African subsidiary, the Union Carriage & Wagon Co. (UCW), had also been sold by ANI. The Comeng Victorian plant was purchased by Asea Brown Boveri (ABB) in 1990, and the work of designing and building rolling stock has continued there to this day-though now under the name of Bombardier. This volume therefore includes the products that have been turned out from the Dandenong plant from the time when Comeng's name ceased to exist. It includes descriptions of the new XPT sleeping cars; the Xplorer and Endeavour railcars; SEPTA transit cars for Philadelphia, and electric locos for India. There are brief descriptions of the other projects during the ABB-Adtranz era. Finally, this volume concludes with a summary of the contracts won by Bombardier up to 2012. John Dunn, began working with Comeng (Granville) in 1956 as an apprentice draftsman. He studied mechanical engineering at Sydney Technical College and then theology at the Adelaide Bible Institute and Sydney's Moore Theological College. In April 2012 his health suddenly declined very rapidly and in June he was diagnosed with Motor Neurone Disease. By August he was no longer able to write or use his computer. His work on the Comeng history ceased and was completed by others under his supervision. John died on 30 December 2012.